Take a sniff! If a plant's green leaves have a sharp, minty smell, the odds are that it's a member of the large mint family. Although spearmint and peppermint are the most popular choices for American gardens, other varieties have fascinating flavors, ranging from chocolate to lavender. Some are purely ornamental. Mint works best in a container. One trait that's common to all mint species: They aren't shy or retiring. Left to its own devices, mint will take over a garden bed--and sometimes the entire backyard. Save yourself from the invasion by transplanting mint into containers. But first you have to identify the mint plants. Both spearment and peppermint have pale lilac flowers. Spearmint (Mentha spicata)and peppermint (Mentha × piperita) are the mint varieties most likely to appear in your backyard. Both have fuzzy leaves with jaggedly toothed edges that smell strongly minty when crushed. Both these mints also bear pale lilac flowers. To distinguish between them, you'll have to take a nibble. A strong menthol aftertaste means peppermint, while a sweet, light flavor means spearmint. Use young spearmint leaves in cooking, peppermint leaves for tea and other drinks. The climate in which the mint is growing can also help you identify it. If you live in a cool climate, your mint is likely peppermint. These plants are hardy down to U.S. Department of Agriculture plant hardiness zone 3. Spearmint does better with heat and can even thrive in USDA hardiness zone 11. Mint leaves can add impact to your cooking. If the mint growing in your backyard has soft, rounded leaves, it might be apple mint (Mentha suaveolens). This plant is also called woolly mint because its stems and leaves are covered with fine, soft hairs. Flower spears are white or pale pink. Less minty than peppermint or spearmint, apple mint tastes fruity. The leaves have a mild, sweet flavor that makes apple mint perfect with salads or fresh fruit. Mint, like many herbs, grows well in sunny windows. Lavender mint (Mentha x piperita 'Lavender') can grow to 3 feet tall and wide, with large, eye-catching flowers. The lilac blossoms are showy enough to make the plant a garden ornamental, and butterflies love them too. The gray-green leaves surprise you with purple undersides. They smell intensely of lavender, and are often used in potpourris and cooking. 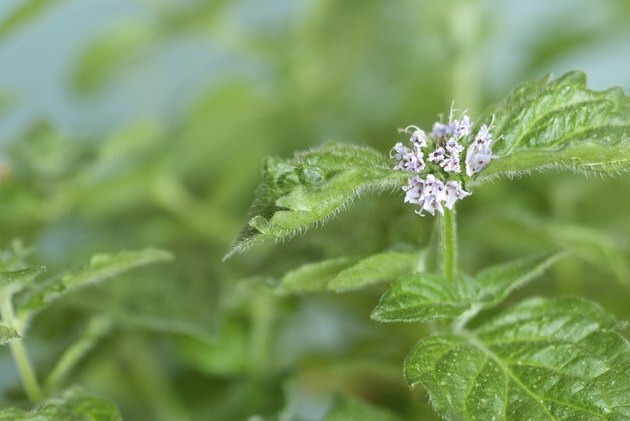 If you are using the leaves to flavor food, pick them before the mint plant flowers for best results. Plant lavender mint in USDA hardiness zones 5 through 9. Here's a chocolate that won't pack on the pounds. Chocolate mint plants (Mentha x piperita 'Chocolate') have handsome dark-green leaves that carry a powerful fragrance reminiscent of chocolate liqueur. This fast-growing mint shoots up to 2 feet tall and spreads rapidly enough to be a useful ground cover. Chocolate mint leaves are long and lance-shaped, providing a lovely contrast to the lavender flowers that appear in summer. This mint thrives in USDA hardiness zones 5 through 9. Plant ornamental mint for its texture and bright leaves. Some mints are not intended to be used for cooking. Instead, you can use ornamental mints to fill in empty sections of a garden with texture and bright foliage. One of these is Corsican mint (Mentha requienii), a lovely, short ground cover that doesn't mind being walked on. It will delight you with its delicate leaves, subtle minty aroma and bright color. It grows happily in USDA hardiness zones 6 through 9.